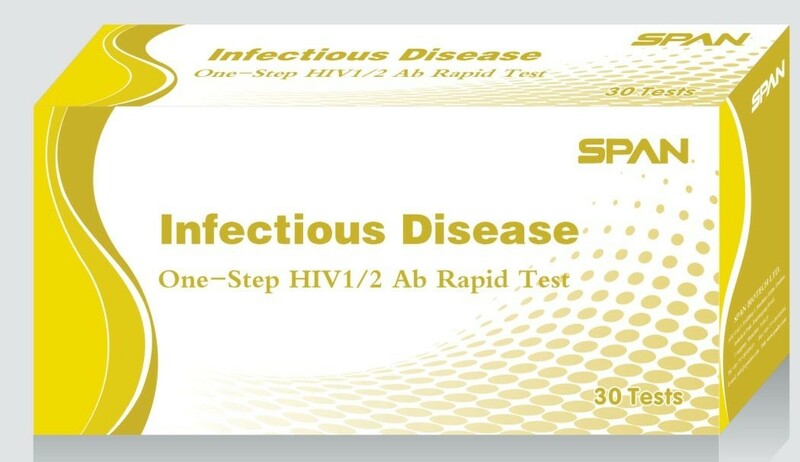 The HIV-1/2 Rapid Screen Test (RST) is a qualitative test for the detection of antibodies to Human Immunodeficiency Virus type 1 and 2(HIV-1/2) in human serum/plasma and whole blood. It is considered as an initial screening test for HIV-1/2 antibodies. All positive specimens must be confirmed with Western Blot or other qualified EIA. 1. For in vitro diagnostic uses only. 2. All patient samples should be treated as if capable of transmitting diseases. 3. Do not use test kit beyond expiration date. 4. Icteric, lipemic, hemolysed, heat treated and contaminated sera may cause erroneous results. It has been shown that the acquired immunodeficiency syndrome (AIDS) is caused by viruses transmitted by sexual contact, transfusion, use of contaminated blood products and sharing contaminated needles. HIV-1 and HIV-2 viruses have been isolated from patients with AIDS and AIDS-related complex (ARC), high-risk persons for AIDS. HIV-1 and HIV-2 viruses delete T helper cells, a subpopulation of T cells for body defense, thus causing AIDS patients susceptible to opportunistic infections and developing malignant tumors. The incidence of specific antibodies to HIV-1/2 is high in AIDS, ARC and persons with high risk for AIDS. The HIV-1/2 Rapid Screen Test is designed to detect antibodies to HIV-1/2 in AIDS patients, ARC or high risk persons and identify any potential donors carrying these antibodies in serum specimens. HIV-1/2 RST is a chromatographic immunoassay (CIA) for the detection of antibodies to HIV-1/2 in human serum/plasma and whole blood. HIV-1/2 specific antigens are precoated onto membrane as a capture reagent on the test region. During the test, specimen is allowed to react with the colloidal gold particles, which have been labeled with HIV-1/2 specific antigens. Antibodies to HIV-1/2, if present, a red colored band will develop on the membrane in proportion to the amount of HIV-1/2 antibodies present in the specimen. Absence of this red colored band in the test region suggests a negative result. To serve as a procedural control, red colored band in the control region will always appear regardless the presence of antibodies to HIV-1/2. 1. One pouched cassette with desiccant. 2. Blood diluent in a dropper bottle, stored at 2-8°C. 3. One piece of operating instruction. 1. Specimen collection container, either plastic or class. 1. Clean the area to be lanced with an alcohol swab. 2. Squeeze the end of the fingertip and pierce it with a sterile lancet. 3. Wipe away the first drop of blood with sterile gauze or cotton. 4. Use micropipet to obtain about 100 ul fresh blood . 1. Have a certified phlebotomist collect whole blood into a purple, blue or green top collection tube (containing EDTA, citrate or heparin, respectively) by veinpuncture. 2. Separate the plasma by centrifugation. 3. Carefully withdraw the plasma for testing, or label and store it at 2-8°C for up to two weeks. Plasma may be frozen at -20°C for up to one year. 1. Have a certified phlebotomist collect whole blood into a red top collection tube (containing no anticoagulants) by veinpuncture. 2. Allow the blood to clot. 3. Separate the serum by centrifugation. 4. Carefully withdraw the serum for testing or label and store it at 2-8°C for up to two weeks. Serum may be frozen at -20°C for up to one year. Add 1 drop (1 drop = 35µl) of sample (whole blood/serum/plasma) into the sample well. After all samples completely absorbed, add 1 drop of diluent. Observe the result in 5-15 minutes. An internal procedural control is included in the test. red line will appears in the control region (C). Negative: No apparent band in the test region (1 and 2), Only one red band appears in the control region (C). This indicates that no HIV1/2 antibodies have been detected. Positive: In addition to the band in the control region (C), other one or two red bands will appear in the test region (1 and 2). This indicates that the specimen contains HIV1/2 antibodies. Store HIV-1/2 Rapid Screen Test at temperature ranges 4-30 °C in the sealed pouch. Refer to the expiration date for stability. Do not freeze. 1. The test is to be used for the qualitative detection of antibodies to HIV. 1. A negative result does not rule out infection by HIV because the antibodies to HIV may be absent or may not be present in sufficient quality to be detected at early stage of infection. 2. A positive result, even a weak positive, must be verified with a confirmation test. 3. As with all diagnostic tests, the result must be correlated with clinical findings. If the test result is negative and suspicion still exists, additional follow-up testing using other clinical methods is recommended. 1. Centers for Disease control: Provisional Public Health Service inter-agency recommendations for screening donated blood and plasma for antibody to the virus causing acquired immunodeficiency syndrome. Morbidity and Mortality Weekly Rep 34: 5-7, 1985. 6. Gallo, RC, et al: Frequent detection and isolation of Cytopathic Retroviruses (HTLV.Ⅲ) from patients with AIDS and a risk for AIDS.Science.